While living in a cramped 240 square foot studio apartment in a New York City coop for over a decade a local couple had to make things work in order to live comfortably. They installed a Murphy bed to allow the sleeping space to be easily converted into the living space during the day and when guests came over. It was a challenge cooking as well with the small kitchenette being crammed into the same room. They did make it work for over a decade but when the opportunity presented itself to enlarge their living space they jumped. The cost of an additional apartment, right above their existing space, was nearly five times as much as when they purchased their original space but was well worth it to more than double their space. In order to combine the two apartments a new sculptural stair was inserted to combine the two and, finally, separate the public and private spaces. The first floor apartment was converted to the permanent private spaces with a sleeping area, on-suite bathroom and ample storage. 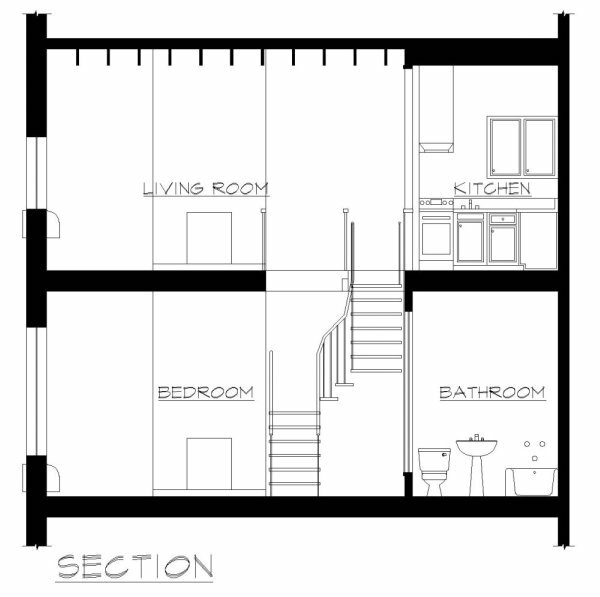 Meanwhile the new second floor apartment became the new home for all the public spaces including a comfortable living/dining room, a still small but much more complete kitchen, and a powder room. With the creation of a larger, more comfortable space, still small at just over 500 square feet, the couple was happy to be immersed in the city, located in the newly revitalized meat packing district just steps away from High Line Park. New, well chosen finishes, lighting, and furnishings complete the apartment and help give it the appearance of being larger than it is.